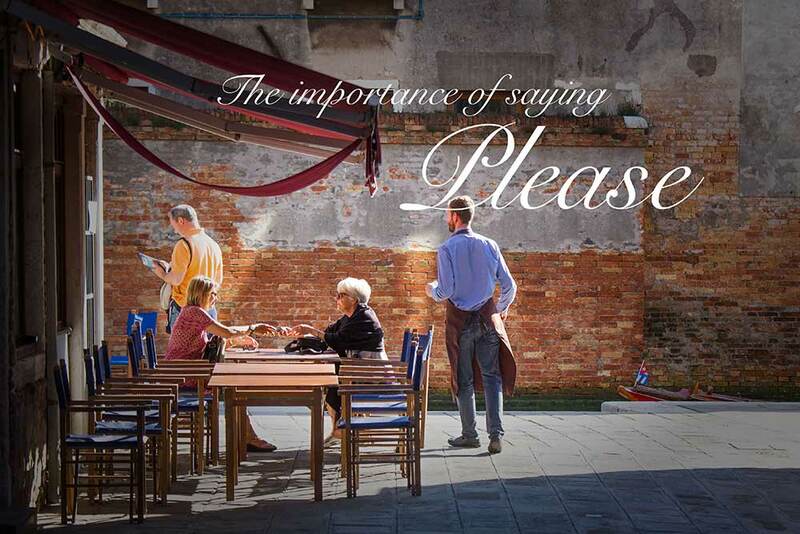 Using the hands to punctuate conversation and emphasize emotional content in a conversation is essential to Italians. For them, the hands are as essential as the mouth for communicating. Hollywood has had a heyday with this…to a fault. I’m not saying the portrayals are inaccurate, just a bit over the top. Sit an Italian in front of a movie screen or TV featuring Italian “characters” and ask them to “weigh in”. Most will roll their eyes and make hands gestures of their own to express outrage that the Americans are “at it again”. Check out the following “brief” YouTube videos explaining some of the most prolifically used gestures. WARNING: In the second video some of these are a bit explicit, so if swearing offends you, you might want to skip over. However, if you’re planning on spending much time in Italy, you’d better start getting used to creative swearing, with words and hands. This brings me to share a piece of advice. Embrace the language and do everything you can to perfect your vocabulary and pronunciation, but leave the Italian hand gestures to the Italians. Understand the “vocabulary” of the Italian gestures so that you know when a person is emphasizing a point, expressing outrage, saying someone is bullshitting them, telling someone to go f#*k themselves, or communicating countless other sentiments. But, if you try to emulate these hand gestures, in my humble opinion, you’re playing with dynamite. These movements of arms and hands are so natural and fluid for Italians because they starting learning them when they were starting to walk. Just try reading up on the breadth of hand gestures and soon you’ll realize how you could end up “mis-pronouncing” with your hands. Italians will spot the pretense right away and it won’t be endearing. Once I tried out the under-the-chin flip-off gesture in a crowded IKEA parking lot when a guy in a truck (way bigger than my car) was honking for me to move. In return I received a frenzy of hand gestures, accompanied by a beet-red face and spittle flying against the window. I was lucky to get out of that parking lot in one piece. I hope you’re realizing that trying out Italian gestures on your own is like waving a loaded gun around. Someone is gonna get hurt…probably you. And, you’ll only have yourself to blame. Perhaps there is an Italian hand gesture school where you can go and become certified. Please write me if you hear of one. I’d love to read testimonials. In the meantime, here is a great link for some history of key “hand phrases”! Enjoy, and keep your hands to yourself.